There's a lot to be excited about in anticipation of the Pan Am Path's completion in 2017. 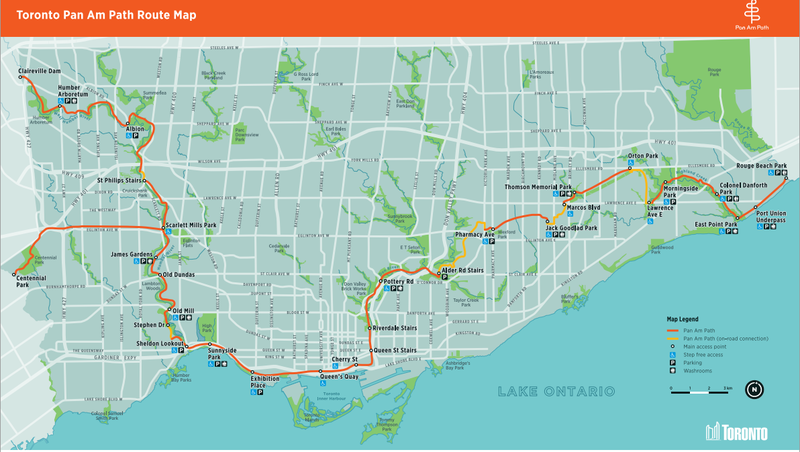 To have 84 km of connected bike and recreation trails spanning the far west and far east ends of the city is a feat of the Pan Am legacy in itself. The project received near-unanimous support from Toronto City Council, and the work on the Path is being completed with $1.9 million in funding from the City. But to ice the cake, Friends of the Pan Am Path hosted the Art Relay, 14 events between May and August 2015 that celebrated the art, nature and diversity of our city. The lasting legacy of their Art Relay are beautiful murals and along the bike trails. Here are some highlights of art that can be found along parts of the Pan Am Path. At Weston-Mount Dennis, near Cruickshank Park on the Humber River, this mural covers the belly of an overpass that crosses the with the Pan Am Path. Dan Bergeron and Gabriel Specter created the piece as a tribute to a natural disaster that marks the history of the Weston and Mount Dennis neighbourhoods. In 1954 Hurricane Hazel had a devastating effect that hit the communities around the Humber River the hardest. On the side of a Centennial College building at the Ashtonbee campus in Scarborough is a reflective art piece by Toronto artist Sean Martindale, in collaboration with arts organization No.9 and students from Centennial College and Wexford Collegiate School for the Arts. The full mural reads "Read Between The Power Lines Look Up Closer," but from different angles, pieces become hidden and the phrase changes. Located in the Scarborough Hydro Corridor, the piece was made of reflective material, celebrating the surrounding environment of the Scarborough Hydro Corridor. 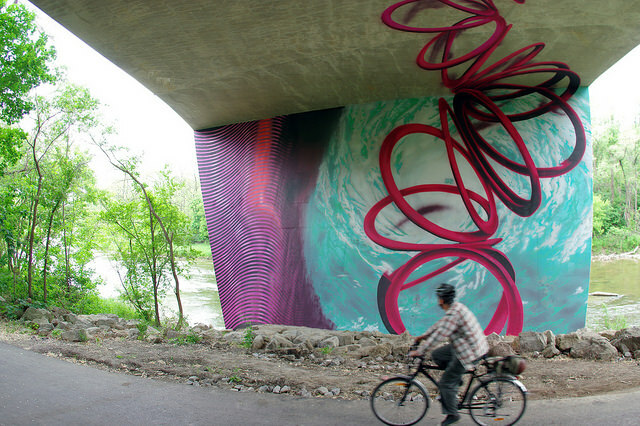 Artists Troy Lovegates and Labrona, with StreetARToronto, transformed Underpass Park from a derelict space under the Eastern Ave, Adelaide and Richmond underpasses on the west side of the Don Valley to a vibrant community space. 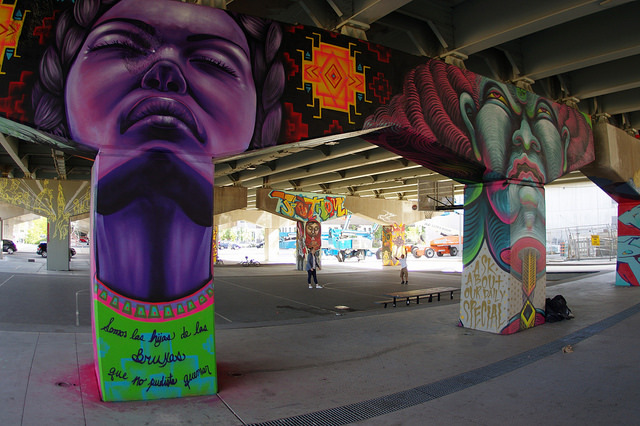 The bright and beautiful murals by Lovegates and Labrona cover five pillars beneath the underpass, and additional works by other artists are also on display. The space features a benches and a playground with a skatepark, making an area that would seem unusable into a gathering space in its own right. The Queen Street Stairs on the Pan Am Path serve as the nearest access point to Underpass Park. 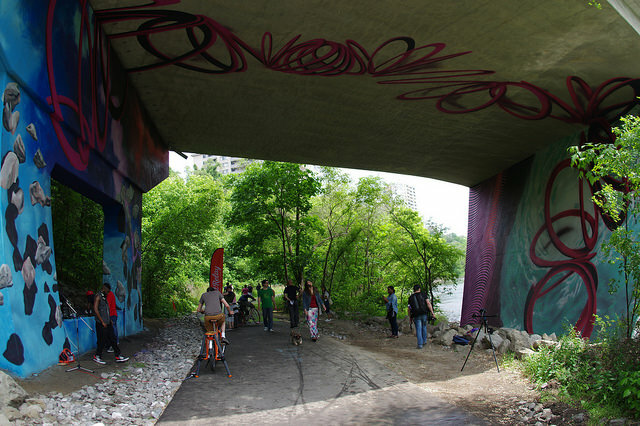 At Pine Point Park –where the 401 crosses over the Humber River– Essencia art collective created the Born This Way mural. The piece, which aims to address discrimination based on sexual orientation, was made in collaboration with the Centre for Spanish Speaking Peoples and Freedom Fridayz. The Essencia collective is based in Toronto and operates over six continents. Three members of the collective; Shalak, Bruno and Fila, worked on the mural, and the other side of the tunnel is filled with contributions from other Toronto graffiti artists. Map of the Pan Am Path route. See the full map on the City of Toronto website.